Gaylord Family-Memorial Stadium has been in the same location since 1923. The stadium opened up with a capacity of 16,000 and now sits 82,112. The field is named after coach Bennie Owen. The lower level is in the shape of a horseshoe. The south end zone has five sections of seating (36-40). The stadium opens on each side of the south end zone. The south end zone features the main scoreboard which sits on top of the Barry Switzer Center. On the north end, the Sooners have another scoreboard that is smaller in size. The seats are different colors for every other section rotating between silver and crimson. The lower level hosts the student section and band from section 26-30. The east side upper levels feature 2,500 club level seats and 23 suites. The seats on this side are crimson colored chair-backs. This part of the stadium was added in 2004. The west side upper level main feature is the press box. The press box proudly displays the years of the Sooners national titles, conference championships, All-Americans and bowl wins they have had. The seats are mostly bleacher seating. The top 13 rows of sections 3-8 you will see chair-back seating which is a part of the Santee Lounge. Walking around the concourse you will see section signs with players on them along with columns featuring pictures of coaches and players. In the northeast corner of the stadium you will find the "National Honors Plaza". Outside of the stadium you will see Heisman park down Jenkins Avenue which also includes Oklahoma legendary coaches. 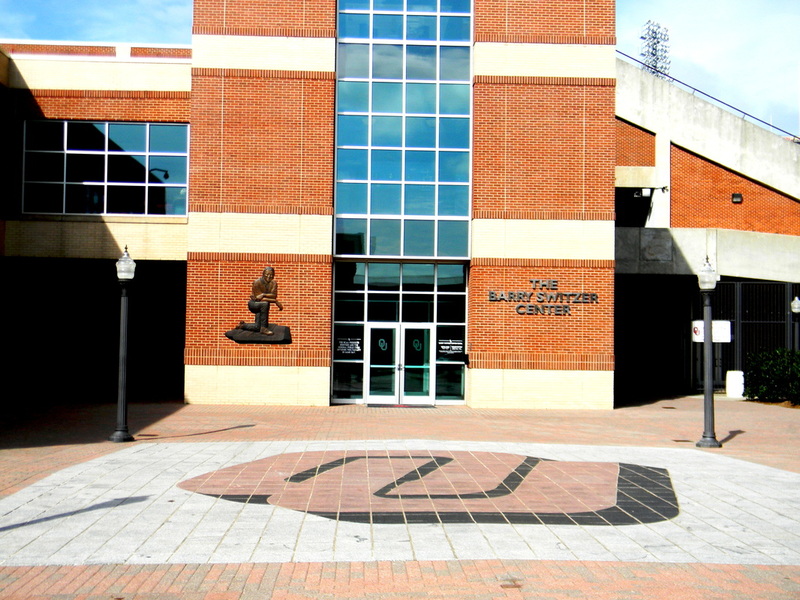 On the north side of the stadium you will find a reflection pool which sits in front of the McClendon Center, a large clock sits on top of the McClendon Center sign. The reflection pool was once filled in and made a flower bed. Close to the reflection pool sits the memorial that pays tribute to those who fought for our freedom. Near the Switzer Center they have the All-American Plaza. The plaza shows all of OU's All-Americans in every sport. 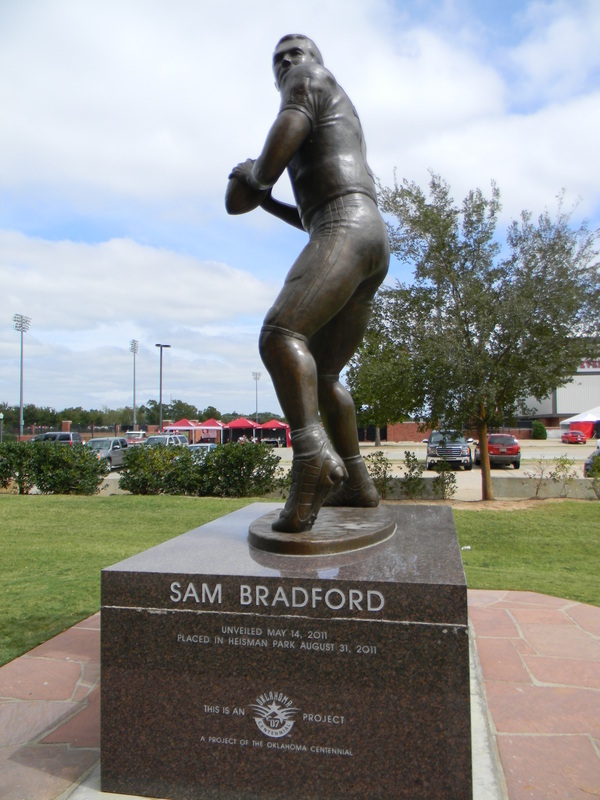 Sam Bradford Statue Outside of Memorial Stadium In Heisman Park. Barry Switzer Center Located at Memorial Stadium. 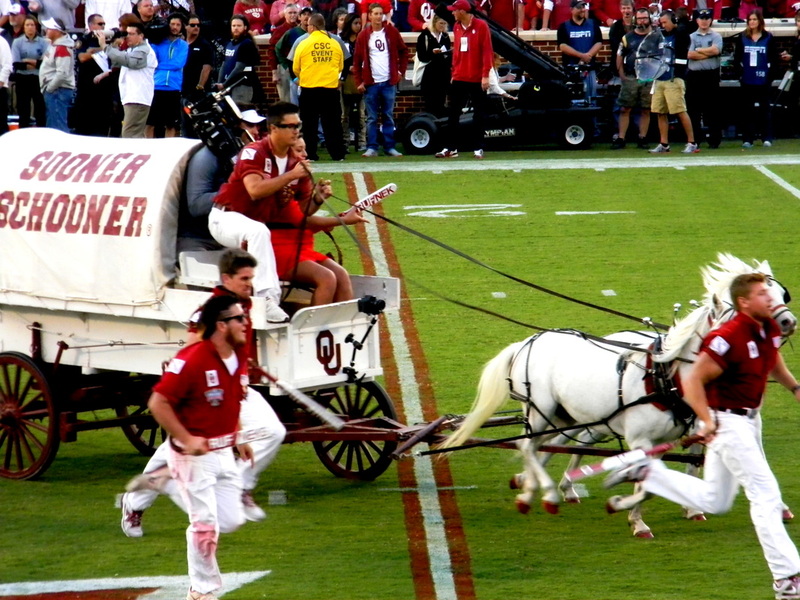 The "Schooner" on Owen Field. #1 Find parking. On campus you can find spots for free at the Noble Center or 20 dollars at non-permit spots. #2 Walk around the campus and take in the tailgate atmosphere. #3 Check out Campus Corner for food and drinks. #4 Heisman Park is a must see down Jenkins Avenue. You'll also find statues of three legendary OU coaches. #5 Head to Memorial Stadium! 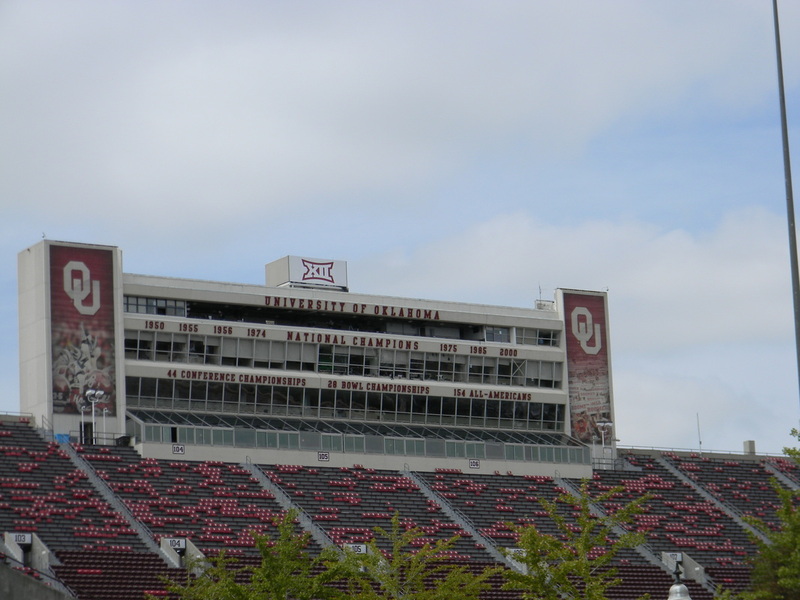 Oklahoma Memorial Stadium: I will start off by saying that Oklahoma Memorial Stadium will be having major renovations so most of my complaints about the stadium will be resolved. The big issue with the stadium is the south end zone. It doesn't fit into the stadium at all. Having the stadium open on that side does not look great because there is not anything significant in the distance to see in the open areas. The press box looks dated, but all the accolades on the front make up for that. The cool thing about the stadium is how much history the field has seen over the years. Several national title teams, Heisman winners, and top coaches. The stadium seating is OK. The seats seem to go high in the upper decks when there could of been added sections and less rows. My favorite part of the stadium is how small the sidelines are for the teams. Some stadiums provide too much room and it takes the fans further away from the action. I can not wait to see how the stadium looks after all the renovations in 2016! Oklahoma Campus: The University of Oklahoma was established in 1890 in Norman, Oklahoma. The University sits on 3,000 acres of land and has an enrollment of just over 30,000. The buildings on campus are designed with a Cherokee Gothic style. The term came from Frank Lloyd Wright when he saw Evans Hall. Evans Hall is located on the North Oval in front of the Bizzell Memorial Library. The President's house sits across from the North Oval and is a historic landmark on campus. In the North Oval sits the Spoon Holder which as legend tells, a kiss at the Spoon Holder and you will end up marrying that person. The library has Cherokee Gothic architecture as well. Inside the library is the Great Reading Room; In front of the library on the west side stands the clock tower. Near the Library is the Oklahoma Memorial Union which is one of the more iconic buildings on campus. To the south of the library is the South Oval. The oval features the best gardens on campus as well as a fountain. At the end of the oval you will find a statue of the "Seed Sower". The South Campus features three athletic facilitates Lloyd Noble Center (basketball), OU Softball Complex, and L. Dale Mitchell Baseball Park. The National Weather Center is also found on the South Campus. A popular sight around campus are the red telephone booths. One of the coolest statues sits outside of the Performing Arts Center, the Pastoral Dreamer. You can also find a place to sit with numerous benches all around the campus due to gifting by alumni of the university. The campus has one of the more energy efficient campuses in the country with the whole university being powered by wind power. 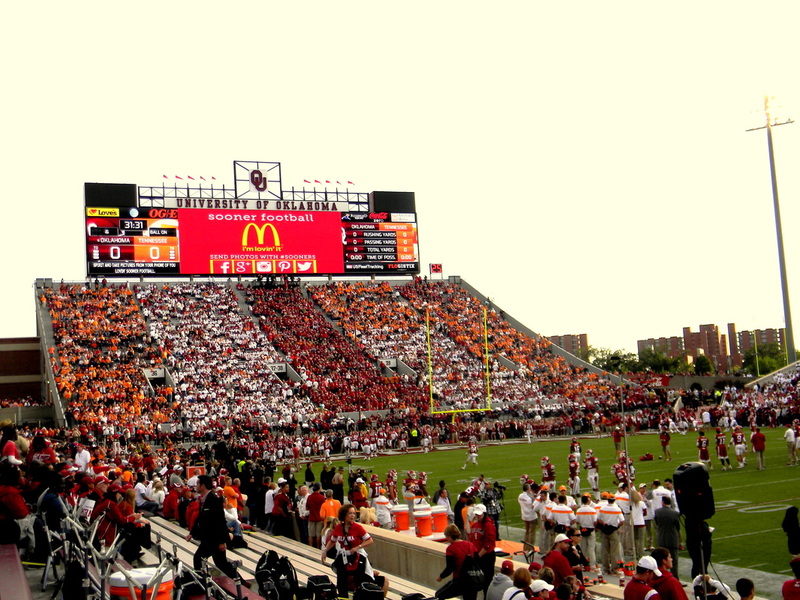 Scoreboard: The Sooners have a great scoreboard in the south end zone. The second scoreboard is nice for fans that sit under the larger scoreboard in the south end zone. The ribbon scoreboards on each upper deck level give you additional game information in a quick glance. Atmosphere: Any time you can visit a stadium when they play a night game, the atmosphere rises. Add a stripe out to the evening and the night is set. The stadium was packed 30 minutes before the game which adds buzz to the kickoff. The students were in the stadium early and were on their feet all night. The band was solid when in the stands, but the halftime show was pretty dull. The tailgating at OU was great! Lots of Oklahoma and Tennessee fans mingling. The Oklahoma fans showed plenty of hospitality from the moment we stepped foot on campus grounds. We were greeted by a group of tailgaters known as "The Order Of The Red Wear" (I believe this is their name) If you get a chance to talk to these guys, you will not be disappointed. 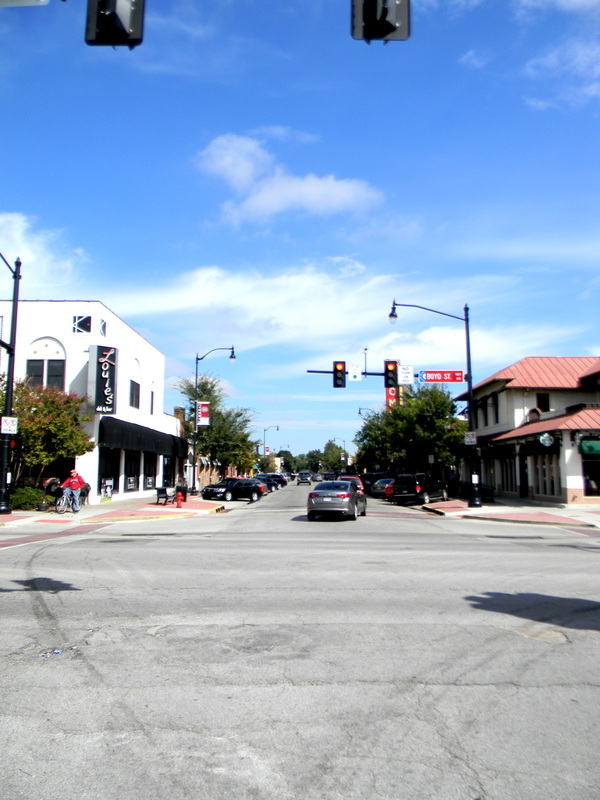 Norman,OK: The city of Norman was founded by a group of surveyors. The surveyors burned "Norman Camp" into the side of an oak tree and eventually the name of the city became Norman. One of the reason the name stuck was because the "Sooners" came and kept the name Norman. What is a Sooner? 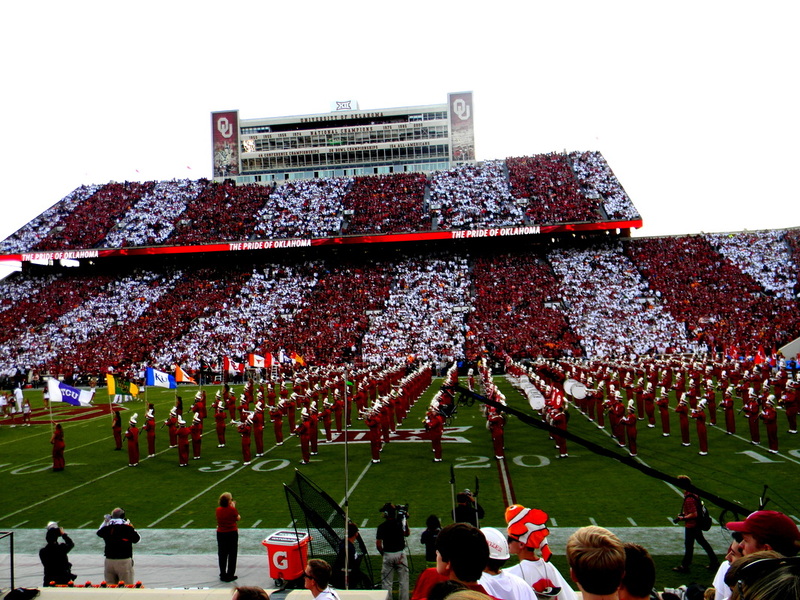 A Sooner is a person who left early during the "Land Run of 1889". Today the city is the third largest in the state with a population over 115,000. One of the largest weekend events in the state is the "Norman Medieval Fair" attracting over 300,000 people during the weekend. Some of the best spots to grab a bite to eat lie on Main Street in Downtown Norman. The Diner is a local favorite for breakfast and for dinner try Tarahumara's. One of the top spots in town sits to the west of campus on Lindsey Street, Ray's Smokehouse BBQ. 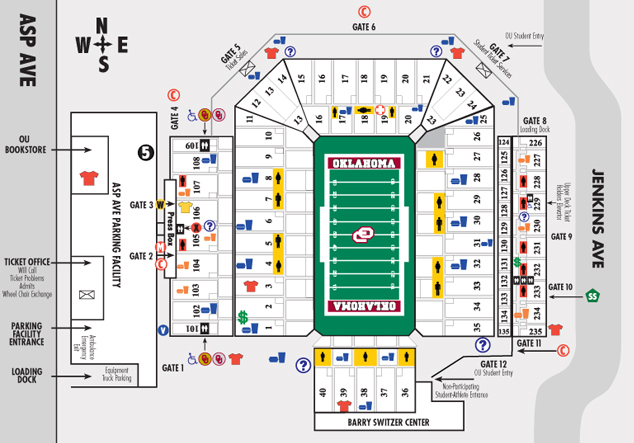 What's Your Rating for Oklahoma Memorial Stadium?